Tablet weight changes can be detected and controlled by monitoring compression force. A tablet press can be instrumented with a strain gauge that senses and reacts to compression force changes. Compression force fluctuation is the result of slight changes in tablet weights. It is normal and expected that powder blends are not perfectly uniform; this fluctuation is detected by checking tablet weights during compression. When tablet weights change they typically trend, either increasing or decreasing in average tablet weight. As tablet weights increase the compression force increases, and as tablet weights decrease the compression force decreases. As blended powders are being compressed there is a consistent and measurable force rhythm that is detected using a strain gauge. The strain gauge sends a signal to control the volumetric powder fill level (weight adjustment cam), which controls tablet weights. Thus we have created a loop; the amount of force to compress is really reporting tablet weight. The controls can be set up to react to the compression force changes, and adjust the weights within a range, or stop the press. If the amount of force is too much, or not enough this is directly attributable to tablet weight, provided that the press is being operated correctly and all parts and components are in good operating condition. When using an automatic weight control device it is important to note that changes to press settings like thickness, speed, force feeders, and pre-compression can be misinterpreted by the force monitor. Proper steps must be followed to prevent improper operation. Then acceptable tablet weight ranges are established so that off weight tablets can be automatically rejected. Automatic Weight control is based on compression force. Anything that influences compression force will change tablet weight. Starting automatic press controls is much like setting the cruise control on our car; you first get going and once you are satisfied you lock it into cruise. The same must happen with the press; first get it set up the way you want it and then ask it to hold your set point (as close as possible). Like cars there are many versions of tablet press controls; not all are created equal and it depends on the vintage. The newer the controls the more they link to other machine functions that can influence compression force while maintaining tablet weight. What I mean is; if the machine is now on cruise control and the operator decides to change anything: speed, pre-comp, thickness, punch penetration, feeder speed, and so on….any of these changes influence compression force which the machine will interpret as a need to change the weight. Some machine controls recognize changes to some of these functions and others do not…again there are many levels and ages of controls. There are many variables that can influence the “signal” that can have a negative impact on true weight control. Consider all of these variables when evaluating a weight control system. Machine condition: The Turret, Pressure rolls, roll shafts, and bearing condition have a huge impact on the “signal”. 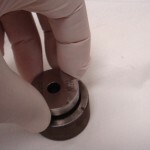 Traditional methods of checking tablet weights at given intervals does not guarantee that all tablets fall within the required weight (dosage) specification. Blend uniformity creates some of the biggest challenges. Even the best blends can drift in and out of acceptable weight specification if they are not monitored closely. Automatic weight control systems do not necessarily guarantee accuracy. If there are other variables such as a worn machine, worn tooling, and some electromagnetic forces for ancillary equipment, then verification that controls are accurate become even more important. The objective is simple; we are making tablets that must be held within an acceptable range. The question is: are the systems you are using providing this guarantee? There are key elements to becoming a cost effective manufacturing team. Managers should be armed with the right tools to guide the productivity and optimization. Their teams should be prepared to react to common problems in the manufacturing environment. Employee performance is the key to holding it all together or seeing the process fail. Effective learning techniques pinpoint key avenues to solving defects and increasing productivity. A simple, yet effective key to managing people is to help them learn. The challenge is that the learning curve is a variable that changes from employee to employee. Repetitive and consistent reinforcement is the key to enhancing the knowledge base rapidly and effectively. Not everyone is willing to admit that they do not comprehend subjects or learn as quickly as their peers, and guessing and assuming leads to trouble. Training the trainers has its limitations and trainer burn out is a real and significant issue. The demand on the manufacturing floor is to understand and follow SOP’s (standard operating procedures) while employing a GMP (Good Manufacturing Practices) mentality. These requirements must be balanced with equipment function and reliability to ensure everything is in good operating condition and ready to perform. 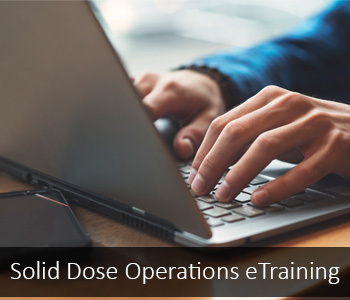 The single most effective key is having a learning system that combines SOP’s, batch records, theory, and actual employee function with a swat team approach. The learning system must be a single source and not be effected on the trainer having an off day, poor attendance, lack of trainee comprehension, or interruptions. The ideal scenario would be a learning station that can be used in a training room or on the production floor. This system could be used to review a procedure, provide self evaluations, and document employee comprehension and performance. This is the most effective way to achieve Cost Effective Manufacturing. Many “health experts” are forcing tablet and capsule manufacturers to eliminate the use of Magnesium Stearate. I have never seen anything work as well and without it tablet quality will suffer. I’m hearing from more and more companies that they must make their tablets without magnesium stearate because of some false claim that it is harmful to cardiovascular health. Magnesium stearate is used two ways for tablet making. The first and most common use is as a lubricant. Without it the tablet would bind in the die during compression and ejection forces will break the tablet apart. Without it tooling life would be greatly reduced and the cost of the final product would rise significantly. Too much mag. stearate will reduce tablet hardness and prevent dissolution because it is non-soluble in water. So if it coats a particle completely than the chances that it will dissolve properly are limited. However, most formulas require less 1% magnesium stearate and only a few require as much as 2%. The second use is to use Mag. Stearate in a pre-blend to reduce positive charges. It can help combine products that want to push each other away. A very small quantity can make a big difference. The bottom line is that alternative products are not as effective and until something else comes along its use will continue. I really want to thank you for sending your questions, praise, and for your patience while waiting for my reply. We have been really busy launching two new items. Our New Training Center: Hands-on training with small groups of people. We have several machines set up to demonstrate how tablets are made and we are teaching individuals the basics of setting up a press, operating it and cleaning. This happens next week, then we have a bigger program in March…come join us. Our new ILS: An Interactive Learning System designed to incorporate our theory and operations sessions with the clients own equipment and operating procedures. This system allows the new or experienced operator the ability learn or review the procedure(s). There are also self examinations that are recorded to show employee improvement. We have a lot more information on our website. Please tell me is there is any method to decide Average punch life? Determining punch life involves analyzing many variables. Punch tool steel type selection has to do the press condition, press speed, compression force required. Premium grades are not always the best choice, it depends of these variables. Punch Tip design: A good design improves compressibility, air release, and a strong blender land will result in greatly extending the life of a set of punches. Fine Powders: the higher the percentage of fine dusty powders the greater the potential for binding, poor ejection, tight punches, and exaggerated wear patterns. Lack of compressibility: Non-granulated powders tend to require higher compression force. The higher the force the greater the wear. Handling: If tooling is mistreated it can easily shorten the life of a set of tooling from years, to a few months, to only a few days. Environments variations: Consistency is the key to manufacturing. Big changes in operating temperature and humidity can change the manufacturing dynamics. Over the years I have inspected tooling that lasted for years and tooling that only lasted a few hours. In the pharmaceutical industry I expect tooling to exceed the 50 million mark. In the Nutritional industry I expect it to last 35 million. For Herbal Products the minimum expected life is 20-25 million. If tooling does not at least make these numbers I would start to look at why and ways to improve. On the other hand I have seen tooling last considerably longer, into the hundreds of millions and still going. It is important to first understand that there are a few factors that relate to maximum compression force to take into consideration. The point maybe made easiest when talking about older tablet presses because newer presses can have interchangeable turrets which requires that the tablet press be capable of the higher compression force rated turret. Traditional “B” & “BB” type presses like a Stokes BB2 or a Manesty BB3B type tablet presses have a maximum rating of 4.5 tons (45kn), while a “D” type press like the Stokes D3 and Manesty Unipress 20 have maximum rating of 7-10 tons (70-100kn). How much compression force do you need? This depends more on the tool tip size than it does on the maximum force rating of the tablet press. As an example I could use a 10 ton press to make a ¼” round diameter tablet. I would simply need to reduce the overload compression force setting to make certain that the press will release to whatever load rating I require. In the case of a ¼” diameter tablet the maximum load a tool can take before bending or breaking would be in the range of 1.0-2.5 tons (10-25kn), so having a press that can exert 10 tons of pressure does little good, unless of course I also need to produce a big ¾” wafer or caplet. If the formulation is not prepared properly (which happens on a very regular basis) it may take more tonnage to make the tablet than should be safely applied to the tooling (also a very common issue). This is where proper press setup comes into play. The operator should always set the overload pressure release set point (compression force) to the maximum limit of the tooling tip size configuration. Most tablet press manuals contain a chart with the maximum load rating based on tip size. This same information is available in the TSM (Tablet Specification Manual) which is published by the APHA. However, I would suggest that when ordering the tooling from your vendor that you specify that they provide the maximum compression force rating with the tooling order. If you cannot make a satisfactory tablet within the tooling compression force rating than you must not blame the tooling or the press…you must formulate or process the powders to work within that acceptable force range, period! 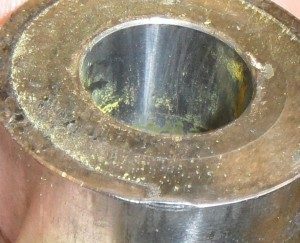 Many companies make the mistake of going beyond the maximum load rating and damaging the tooling and the press (when a punch breaks nothing good happens). In summary; most companies do not use the compression force overload adjustment settings correctly which does result in premature wear and damage to the tooling and sometimes the press. Many formulas are not proven and tested properly. Too many companies “validate” a process that turns out to be a mess and does not perform under demands of production. Blending in solid dose manufacturing has two objectives; 1) To achieve blend uniformity and 2) to distribute the lubricant. In (objective 1) the blend step(s) are designed to achieve homogeneity of all components prior to the final blend of the lubricant (objective 2). The challenge is that there is no such thing as a perfect blend. Blending is like shuffling a deck of playing cards; there is just no such thing as a perfect shuffle. As with shuffling playing cards, blending powders is even more of a challenge due to particle size, moisture content, structure, bulk density and flow characteristics. The bottom line is that blending techniques for tablet making must produce predictable and repeatable results to achieve content uniformity and proper function. The first step in achieving predictable results in a blend is to introduce the proper particle profile within a range; between 40 – 180 mesh for most oral solid dosages. We do not want any particles larger than 20 mesh and try hard to limit the percentage of fines to less than 20% smaller than 200 mesh. The next step is to complete pre-blending steps in a carefully planned order of addition. In other words we need to blend powders with a strategy. Many formulators blend actives and then excipients, others add based on percentages. Over the years I have found that the best success is to know your objective. Simply realize the goal to deliver an active ingredient that holds together, produces predictable results, disintegrates correctly and dissolves when you want it to, only after having sustained the correct shelf life…so what could be the problem? The best thing is an example of an existing formula; say I have a dry granular formula and a number of overly fine waxy actives, along with a flow agent, bulk agent, and a binder. My first question is how does it flow, then how does it compress and the how does it eject, then how does it disintegrate, dissolve and stability and shelf life. I would use the waxy fine particles to coat the larger dry particles to aid compressibility. Then I would add the binder and bulk agents and test between steps for proper parameters of the deleveloping tablet. Too many formulas are old recipes without rhyme or reason. Many formulas are excellent but are not blended correctly; the key to a successful formula is the order of addition. Since each formula is different there are many factors to be considered for each and every formula. When all ingredients are dumped into the blender, optimization is rarely achieved and many times flow, compression and ejection are put into jeopardy. The key is proper addition including the lubricant. Add the lubricant last, by itself; never blend it with anything else, and only blend for a short duration. Under blending a lubricant is better than over blending it. I hope this helps….any questions or comments please let us know. What are the determining factors for achieving the correct particle size distribution of a tablet formulation? I recall some 30 years ago being taught that the general rule of thumb is: particle size distribution needs to be small enough to go through an 18 mesh screen yet big enough as to not go through a 200 mesh screen. While machine type and condition play a role, the following list of items should also be considered. Flowability: Generally speaking the smaller the particle the worse the flow. Compare powdered sugar with granular sugar. The fine small particles in powdered sugar aide dissolution but not flow. Feeder clearance: Particle size must be larger than the feeder clearance to prevent leakage. Die table run-out: If die table run-out increases, feeder clearance and particle size must also increase proportionately. 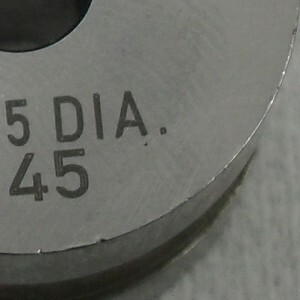 To check run-out, use a dial indicator to determine the variation of the die table. Die fill: Wide variations in particle sizes can cause inconsistent fill volumes. Weight control: Final volume is final weight. 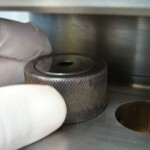 Larger particles pulled out of the die can reduce the final weight. Fine particles require more precise scrape-off and increase the need for a good scraper blade. Compressibility: Improves with increased particle size and decreases as particles become smaller and smaller. Small particles have less ability to lock together during compaction. Hardness: Smaller particles are more sensitive to over-compression. Ejection force: Small particles decrease interstitial space and increase drag and friction. Lubrication levels: In general higher percentages of small particles require increased quantities of lubricant. Magnesium stearate is the most commonly used lubricant and should be de-agglomerated before use. Disintegration & Dissolution: Small particles decrease disintegration time, and increase dissolution. Friability: Larger particles usually lock together better which results in reduced friability while small particles often increase the potential for failure (higher friability). Electro Static effects: Electro static charge is increased as the percentage of small particles increases. Dust control: Fine particles create a dusty operation, creating a need for frequent production stoppages and press clean-ups. Environmental conditions: Many products are hygroscopic and sensitive to heat. Variations in room conditions can result in poor flow, compression and ejection conditions. Lamination & Capping: Small particles are the heart of the most common defects. Punch lubrication: Dust and super fine particles become airborne and combine with the oils and greases which can produce black specks in tablets. Tooling condition: Punch tip & die clearance are designed to control air release allowing for improved compaction. Machine condition: Cleaning and maintenance are downtime issues. A high percentage of fine particles and dust increases the potential for greater wear, increased cleaning frequency, reduced yield, greater particle segregation, and more tablet defects. 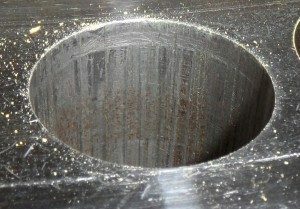 Cost: Fines (small dusty particles) increase operating costs, require increased levels of dust collection, decreased yields, increased frequency of cleaning, and generate greater machine & tool wear. Reducing fines will improve tablet quality. Summary: Establishing an appropriate particle size distribution will improve tablet quality and will reduce overall costs in the long run. Fine dusty particles are the source of most tablet defects.